Homemade Dog Treats, Cat Treats, and More! 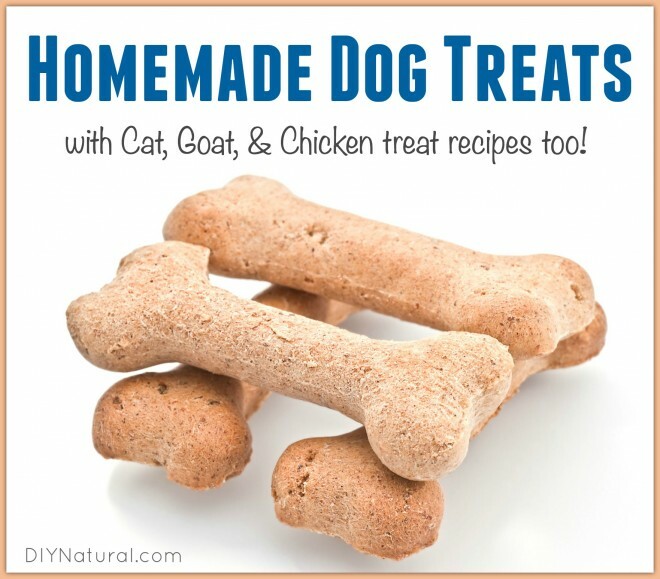 Home DIY Natural Blog Food Homemade Treats for Dogs, Cats, Goats, & Chickens! Homemade Treats for Dogs, Cats, Goats, & Chickens! I have two dogs, a cat, two goats, and four chickens. I feed them a well balanced organic diet, but sometimes when they are extra good, I like to give them a treat. I’ve read about all sorts of things being added to pet food and treats that they don’t need and shouldn’t have, so I set out to make my own. Here is an easy recipe for dog treats. They take very little time and can be adjusted to suit your dog’s taste buds. Mix everything together and when dough forms, knead well. Roll out to ½-inch thick and cut with a cookie cutter. I used a bone shaped one (find them here). Bake at 350° for 20 minutes. Cool overnight and store in an airtight jar. Variations: Add ½ cup shredded carrots, ½ cup unsweetened applesauce, or ¼ cup cooked, chopped bacon. Your dog will love you for it! Cats are a bit more finicky and tend to not like things like peanut butter or molasses. For them we have something different. Mix together until dough forms a ball. Knead and roll out to ¼-inch thick. Cut into small, bite size pieces. Bake at 350° for 10-15 minutes. Cool and store in an airtight jar. Combine all of the ingredients in a bowl. Roll into small balls and freeze. Take out enough for 3 days as they will last about this long if kept refrigerated. My goats love these. The carrots can be traded out with raisins, apples, bananas, or zucchini. If using another ingredient that has more water, you may need to decrease the amount of molasses. Mix everything together and form small cookies. Bake at 325° for 25 minutes or so. Watch carefully, these can burn easily! Cool and store in an airtight container. What chicken doesn’t like worms? This recipe contains lots of nutrition and some fun ingredients too. Mix all of the dry ingredients together in a large heat-proof bowl. Pour boiling water over the top and mix. Let sit for a few hours so the liquid can be soaked up and the water can cool. It will cook the noodles and rice enough for your girls (and guys too!). When cooled, sprinkle the top with mealworms and serve. My girls love the spaghetti “worms” and even fight over them. I don’t give them too much at a time, just as an occasional treat. They’re not crazy about the peas and carrots, but they get some of the nutrients from them and the goats will clean up the rest. You can use the goat treats for llamas, horses, and cows too. They love the sweet taste and get some nutrition as well. Turkeys and guineas also go nuts over the Chicken Treat “worm” mixture. Have you ever made your own treats for your animal(s)? What ingredients did you use? How did your animal(s) like them? I would love to make the dogtreats for my dog but one thing is bothering me. I have always been told that dogs cannot have nuts. That it can be very dangerous to them. I’m sure Debra would not recommend a recipe that is dangerous for dogs but I still feel unsure about using peanut butter. Any comments? Thank you for clearing that up. Off to make some yummy treats for my little drooling companion. Hi, I just wanted to kindly mention that cats don’t tolerate grains that well; they are carnivores and do best with animal protein. I would also have some concern with the honey. How about dehyrated chicken livers or something like that? Catinfo.org is a great site authored by a vet. Thank you. Of course you can use dehydrated livers, Jen, if you are concerned. Small amounts of grains and honey, occasionally, meant as treats are fine. I wouldn’t recommend them for a staple diet. Try an enzyme based cleaner, available most anywhere that sells pet supplies. This is very natural. You can also try soaking the wood with white vinegar. Normally I wouldn’t tell people to soak wood, but in this case, it’s already been wet and needs to get the vinegar into the same space to be effective.